Observed through the high-resolution telescopes mounted on NASA’s SDO spacecraft, the Sun – a hot ball of plasma, teeming with magnetic field lines traced by giant, fiery loops — seems to have few physical similarities with Earth. But our home planet provides a few useful guides in parsing the Sun’s chaotic tumult: among them, rain. On the Sun, Mason said, coronal rain works similarly, “but instead of 60-degree water you’re dealing with a million-degree plasma.” Plasma, an electrically-charged gas, doesn’t pool like water, but instead traces the magnetic loops that emerge from the Sun’s surface like a rollercoaster on tracks. At the loop’s foot points, where it attaches to the Sun’s surface, the plasma is superheated from a few thousand to over 1.8 million degrees Fahrenheit. It then expands up the loop and gathers at its peak, far from the heat source. As the plasma cools, it condenses and gravity lures it down the loop’s legs as coronal rain. Mason is currently working on a computer simulation of the new explanation, but she also hopes that soon-to-come observational evidence may confirm it. Now that Parker Solar Probe, launched in 2018, is traveling closer to the Sun than any spacecraft before it, it can fly through bursts of slow solar wind that can be traced back to the Sun — potentially, to one of Mason’s coronal rain events. After observing coronal rain on an open field line, the outgoing plasma, escaping to the solar wind, would normally be lost to posterity. But no longer. “Potentially we can make that connection with Parker Solar Probe and say, that was it,” said Viall. The solar wind extends outward from the solar corona, suffusing interplanetary space with plasma and magnetic fields. While the solar wind has traditionally been designated as either “fast” or “slow” based on its velocity, a new study suggests that there may be a better way to characterize this highly variable plasma flow. 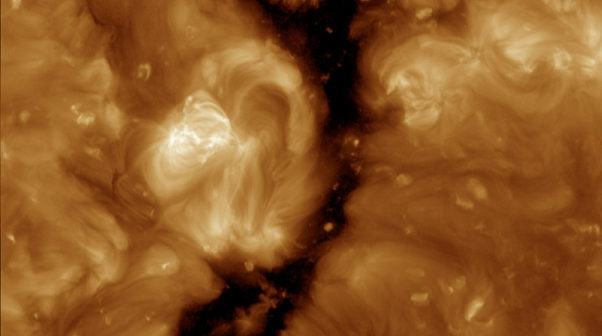 The fast solar wind is thought to originate from coronal holes — regions of open solar magnetic field lines. The slow solar wind has been associated with streams of coronal plasma emitted from near the Sun’s equator, but this source location for the slow solar wind is still up for debate. The formation mechanism for the slow solar wind is also uncertain; one of the persistent questions of solar physics is whether the slow and fast solar wind form in fundamentally different ways. Solving the mysteries of where and how the slow solar wind forms may rely on first finding a better definition of what constitutes the slow and fast solar wind. While regions of slow and fast solar wind have traditionally been separated based only on velocity, the parameters of the solar wind — such as the density, temperature, and ionization state — vary broadly for a given solar wind speed. Yuan-Kuen Ko of the Naval Research Laboratory and collaborators argue that there is a better way to distinguish between the different states of the solar wind. By analyzing data from NASA’s Advanced Composition Explorer (ACE), a solar and space exploration mission launched more than two decades ago, Ko and collaborators found that the slow and fast solar wind may be better distinguished by the magnitude of their velocity fluctuations rather than their absolute velocities. To demonstrate this, the authors compared the velocity fluctuation, δvT, to other observed solar wind properties. With the exception of the plasma beta — the ratio of the thermal pressure to the magnetic pressure — δvT correlates well with all observed solar wind properties. Ko and collaborators also explored the effect the phase of the solar cycle has on solar wind parameters by comparing data from two time intervals: one from the period during which solar activity is declining, and one near solar minimum. The authors found that while the absolute values of the solar wind parameters during epochs of low δvT varied between the two phases, their overall behavior did not; parameters that increased with increasing δvT did so during both the declining phase of the solar cycle and solar minimum. What does this mean for the formation of the slow solar wind? Ko and collaborators derive three potential slow-solar-wind formation scenarios from their findings, none of which are mutually exclusive. Distinguishing between these scenarios will have to wait — but not for long. Luckily, the next decade brings two highly anticipated spacecraft that will increase our understanding of the solar corona and solar wind, including the formation of the slow solar wind: NASA’s Parker Solar Probe, which started its journey to the Sun in August 2018, and ESA’s Solar Orbiter, which is scheduled to launch in February 2020. “Boundary of the Slow Solar Wind,” Yuan-Kuen Ko, D. Aaron Roberts, and Susan T. Lepri 2018 ApJ 864 139. Using data from NASA’s Solar Dynamics Observatory, or SDO, the scientists examined an October 2014 Jupiter-sized sunspot group, an area of complex magnetic fields, often the site of solar activity. This was the biggest group in the past two solar cycles and a highly active region. Though conditions seemed ripe for an eruption, the region never produced a major CME on its journey across the Sun. It did, however, emit a powerful X-class flare, the most intense class of flares. 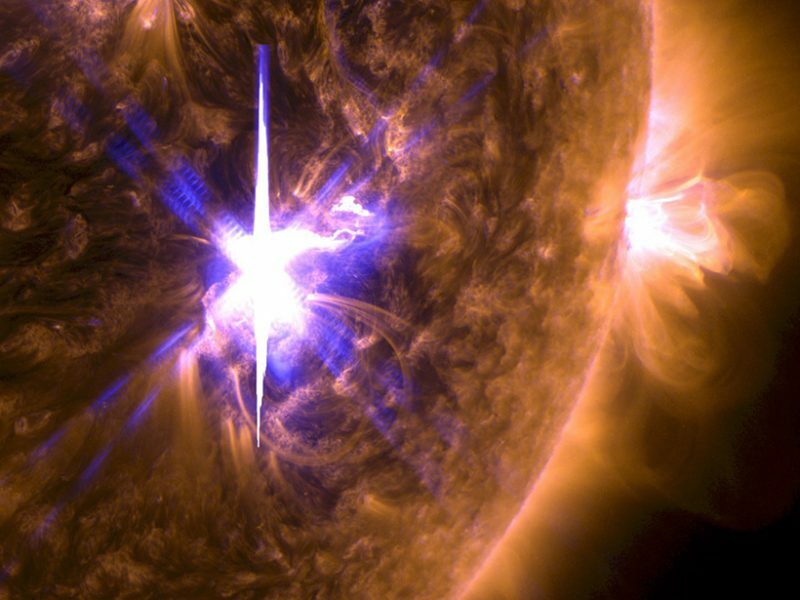 What determines, the scientists wondered, whether a flare is associated with a CME? On Oct. 24, 2014, NASA’s SDO observed an X-class solar flare erupt from a Jupiter-sized sunspot group. Credits: Tahar Amari et al./Center for Theoretical Physics/École Polytechnique/NASA Goddard/Joy Ng. In this series of images, the magnetic rope, in blue, grows increasingly twisted and unstable. But it never erupts from the Sun’s surface: The model demonstrates the rope didn’t have enough energy to break through the magnetic cage, in yellow. Credits: Tahar Amari et al./Center for Theoretical Physics/École Polytechnique/NASA Goddard/Joy Ng. From long, tapered jets to massive explosions of solar material and energy, eruptions on the sun come in many shapes and sizes. Since they erupt at such vastly different scales, jets and the massive clouds — called coronal mass ejections, or CMEs — were previously thought to be driven by different processes. Scientists from Durham University in the United Kingdom and NASA now propose that a universal mechanism can explain the whole spectrum of solar eruptions. They used 3-D computer simulations to demonstrate that a variety of eruptions can theoretically be thought of as the same kind of event, only in different sizes and manifested in different ways. Their work is summarized in a paper published in Nature on April 26, 2017. Follow the evolution of a jet eruption in this video, which uses a 3-D computer simulation of the breakout model to demonstrate how a filament forms, gains energy and erupts from the sun. The study was motivated by high-resolution observations of filaments from NASA’s Solar Dynamics Observatory, or SDO, and the joint Japan Aerospace Exploration Agency/NASA Hinode satellite. Filaments are dark, serpentine structures that are suspended above the sun’s surface and consist of dense, cold solar material. The onset of CME eruptions had long been known to be associated with filaments, but improved observations have recently shown that jets have similar filament-like structures before eruption too. So the scientists set out to see if they could get their computer simulations to link filaments to jet eruptions as well. Solar scientists can use computer models like this to help round out their understanding of the observations they see through space telescopes. The models can be used to test different theories, essentially creating simulated experiments that cannot, of course, be performed on an actual star in real life. The scientists call their proposed mechanism for how these filaments lead to eruptions the breakout model, for the way the stressed filament pushes relentlessly at — and ultimately breaks through — its magnetic restraints into space. 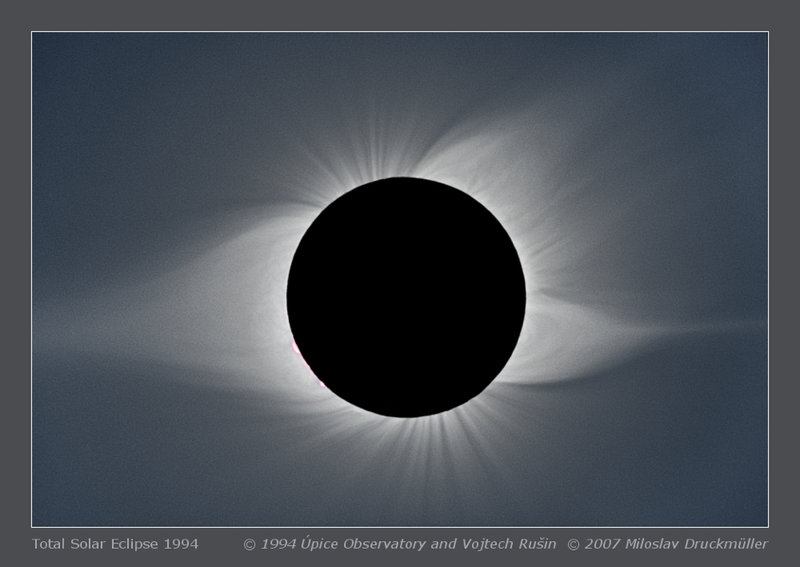 They previously used this model to describe CMEs; in this study, the scientists adapted the model to smaller events and were able to reproduce jets in the computer simulations that match the SDO and Hinode observations. Such simulations provide additional confirmation to support the observations that first suggested coronal jets and CMEs are caused in the same way. The key for understanding a solar eruption, according to Wyper, is recognizing how the filament system loses equilibrium, which triggers eruption. In the breakout model, the culprit is magnetic reconnection — a process in which magnetic field lines come together and explosively realign into a new configuration. In stable conditions, loops of magnetic field lines hold the filament down and suppress eruption. But the filament naturally wants to expand outward, which stresses its magnetic surroundings over time and eventually initiates magnetic reconnection. The process explosively releases the energy stored in the filament, which breaks out from the sun’s surface and is ejected into space. Exactly which kind of eruption occurs depends on the initial strength and configuration of the magnetic field lines containing the filament. In a CME, field lines form closed loops completely surrounding the filament, so a bubble-shaped cloud ultimately bursts from the sun. In jets, nearby fields lines stream freely from the surface into interplanetary space, so solar material from the filament flows out along those reconnected lines away from the sun. Confirming this theoretical mechanism will require high-resolution observations of the magnetic field and plasma flows in the solar atmosphere, especially around the sun’s poles where many jets originate — and that’s data that currently are not available. For now, scientists look to upcoming missions such as NASA’s Solar Probe Plus and the joint ESA (European Space Agency)/NASA Solar Orbiter, which will acquire novel measurements of the sun’s atmosphere and magnetic fields emanating from solar eruptions.